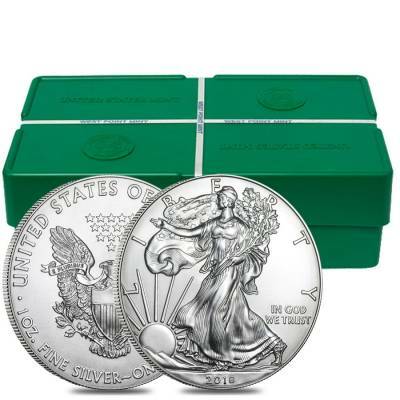 This exceptional 2018 1 oz Silver American Eagle $1 Coin is the new release in the iconic Silver American Eagle Series from the United States Mint. 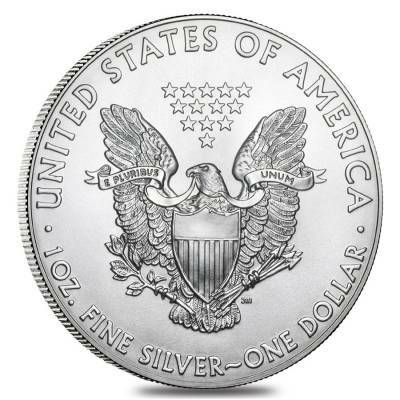 The first Silver Eagle coin was released by the US Mint on November 24, 1986. The obverse design of this legendary coin hasn’t changed since its debut, depicting one of the most graceful and famous American images - Liberty walking towards a rising sun - created by Adolph A. Weinman for the half dollar coins minted between 1916 and 1947. This coin presents the finest traditions of the United States: freedom, equality, and patriotism. It is regarded as the official silver bullion coin of the US and is among the most beautiful coins in the world, produced in just one size - 1 troy ounce. For this reason, this astounding piece is a timeless addition and a must-have for any bullion collection. 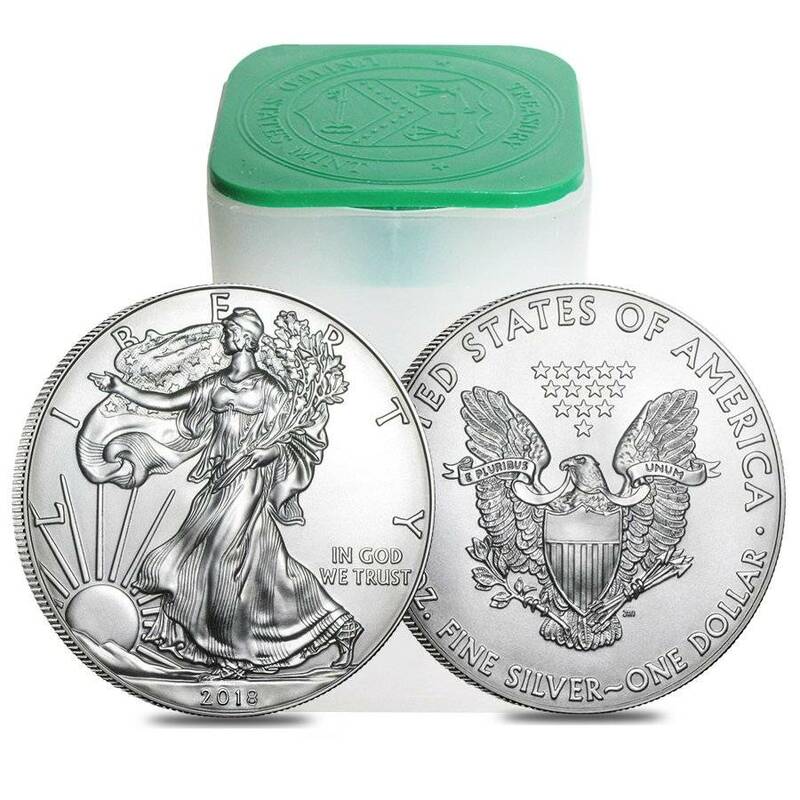 Made from .999 fine silver, with a weight of 1 troy ounce. Struck by the renowned US Mint. Individual coins come in plastic flips. Lots of 20 come in mint-issued tubes and lots of 500 come in mint-issued monster boxes. Carries a face value of $1 USD. US legal tender coin assured by the US Government. 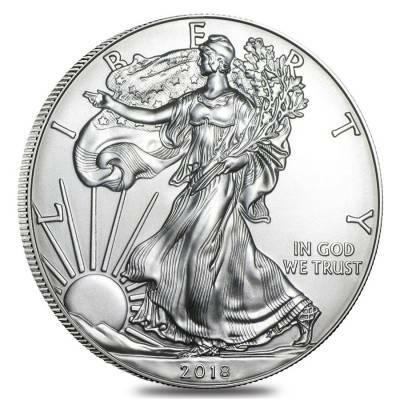 Obverse: Depicts the famous Walking Liberty image created by Adolph A. Weinman. It showcases Lady Liberty confidently moving towards the sunrise with her body wrapped in the folds of the US flag and holding a laurel oak in her left hand. This superb image is framed by the inscriptions “Liberty,” “In God We Trust” and 2018”. At Bullion Exchanges, you will find a wonderful selection of the legendary bullion pieces from the most prestigious refineries. 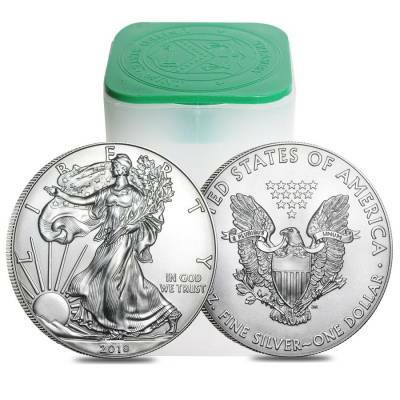 Add this astonishing coin to your portfolio today, and it will be thoroughly packaged and shipped to your address. If you have any questions, just contact us at 800.852.6884, or message us, and our customer service representatives will be happy to assist you. Can't say enough very happy all around. I get these coins every year they come out and they continue to mesmerize me...thanks guys! Terrific specimen. You can't go wrong with Bullion Exchanges. Really trusted gold dealer. Always great service! I collect every release of these, this one is no disappointment! the design of this coin just blows me away. such a good price. can't wait for it to ship! Look forward when these stunning coins will be ready for delivery. That's my third Silver American Eagle. Thanks for pre-sale. just placed an order for presale. Hoping since its the first coins from the press i can get 70's out of them.